This post addresses the benefits of using a hardware encoder vs. a software encoder in your live video streaming setup. It's part of our series on video encoders. Encoding is the process of compressing large video files for easier uploading to the internet. Broadcasters who use video cameras in their live streaming setup need either a hardware or software encoder for the job. A hardware encoder takes a feed from your camera and audio sources or your video mixer into a physical box. A hardware encoder connects directly to the internet to send the feed. A software encoder requires a computer on site. In this setup, video sources send signals to the computer with a video capture device. The software reads the input and pushes the stream to the internet through the computer's internet connection. 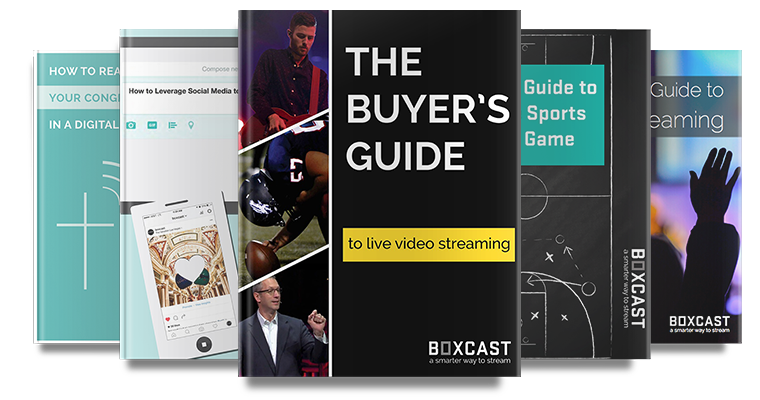 At BoxCast, we believe in making high-quality live streaming easy. When we decided to build encoders to pair with the easy-to-use BoxCast Platform, we chose to offer hardware instead of software. A setup with a hardware encoder is less complicated and more consistent for organizations who live stream regularly. If you live stream frequently and have a small team, adding computers to your setup increases complexity. It's impossible to create an automated, quickly repeatable workflow with a computer. Every time you need to stream, you burden yourself with the task of setting up the streaming environment on the computer, checking your network, reconnecting your video sources via your video capture device, opening the software, and re-testing to make sure you did it all right. Using software encoders means you'll be setting up from scratch each time you broadcast an event. The extra time can be a burden on a small production team. With hardware encoders, your setup is more repeatable. You can leave your equipment connected and automate many parts of the process. With the BoxCast hardware encoders, you can save time by scheduling broadcasts days or weeks before you go live. Hardware encoders simplify your setup. In addition to the hassle they cause in your setup, computers create a host of additional headaches. Using a software encoder on a computer introduces the potential pains of computer and software updates, CPU usage limits, network connection issues, and security problems. With a laptop or desktop involved, you open yourself to many more obstacles and difficulties that might prevent a successful broadcast. Unlike computers, hardware encoders are dedicated to one task— encoding your video. Hardware encoders free you from having to worry about other computer-related hassles such as CPU usage, memory, and network security issues. Hardware encoders aren't the right solution for every broadcaster. In many situations, your team may benefit from using software. However, if your goal is to simplify your streaming process and eliminate risks and pain points, hardware encoders are your answer. What's the Difference in SDI Signals (3G, 6G, 12G, Quad Link, etc)?